Growing up in a racing family and helping out at the stables and riding track work gave Jonathan Crowley a good grounding for his first job as a 17 year-old at Coolmore in his native Ireland and then in Australia. Lured by the sun and the lifestyle and determined to make his life here, he is now on the nominations team at the fast growing Aquis Farms in Queensland. A DEFINING moment in Irishman Jonathan Crowley’s life came a little over three years ago when, after having spent eight years with Coolmore in the Hunter Valley, he was transferred back to the operation’s stud in County Tipperary. After the warmth and sunshine of Australia, Jonathan soon found the cold, damp conditions of Ireland eating into his bones. Within a few months he decided to return “down under”. This led to him ultimately landing a position in the nation’s thoroughbred industry last November with Aquis Farm at Canungra in the Scenic Rim region, 35km west of Queensland’s Gold Coast where he’s now involved in the nominations team. A holding spreading over 447ha of rolling land, the farm’s four properties were developed in spectacular fashion by the subsequently financially troubled Nathan Tinkler. The holding was saved from possible loss to the thoroughbred industry in March 2015 when bought by the Hong Kong-based Fung family, whose chairman Tony Fung has been an enthusiastic investor and developer in Australia for nearly two decades. An indication of the speed Aquis Australia is becoming involved locally is the recent three year agreement reached with the Gold Coast Turf Club and Event Centre, which includes the naming of the racecourse as Aquis Park. A horse heaven, the farm boasts first class amenities and in the words of Justin Fung, “the goal is to provide optimal living and training facilities so clients can be confident in the quality of care received by their horses”. As a new breeding season approaches Aquis Farm has seven stallions on its roster. After standing Spill The Beans, Holy Roman Emperor (IRE), Domesday and Benifica last year, Husson (ARG), Furnaces and Sweet Orange (USA) have since been added to the roster. Husson will command a fee of $13,200, Spill The Beans $11,000, Holy Roman Emperor and Furnaces are each at $9900, Domesday is $8800, while Benificia and Sweet Orange are at $4400. Under a joint venture arrangement Aquis is now also managing Emirates Park at Murrurundi, as well as the stud’s stallions Al Maher, Artie Schiller (USA), MRC Caulfield Guineas-Gr.1 winner Divine Prophet and Dream Ahead (USA). The Gr.2-winning More Than Ready (USA) horse Kiss And Make Up, who was originally to have stood at Canungra, has been transferred to the Hunter Valley property. In a deal with James Harron, Aquis has bought into the BRC Sires’ Produce Stakes-Gr.2 and ATC Bailieu Handicap-Gr.3 winner Attention, who is by Stratum from the Snowland mare Flamboyance. He was to stand in 2017 but has now been kept in training and in all likelihood will begin his stud career in 2018. Standing stallions, with walk-in options, is only a part of the services provided by Aquis Farm, as one of the most prized features on offer is the pre-training. There is a superb 1800m grass track, a 1750m all weather sand track, a 65m lap pool, as well as aqua and horse walkers to work with. A re-education and freshening up program is also available, along with agistment, a foaling down service, weaning and yearling sales preparation. “It’s a gorgeous property and it’s all very exciting,” Jonathan said. “Aquis is a young, dynamic thoroughbred operation and from my more traditional experience in the industry I am very excited about the direction the farm is heading. “We have our sights set on revolutionary and innovative ways to serve the breeder both in Australia and overseas. I see the farm moving confidently into the future by breaking new ground and delivering unique opportunities in a way that no other stud has done before us. What we have achieved so far and what we are looking to achieve going forward is very exciting. Thoroughbreds have always been part of Jonathan’s life as he is from a family steeped in racing tradition. He was born at Midleton in south-eastern County Cork, famous for its Chore Abbey, which was built by the Normans in the 12th Century. His father John had been a prominent rider over the jumps with his victories featuring the Irish Grand National on Herring Gull in 1968, as well as riding winners at Cheltenham Festival. On retiring from the saddle he turned to training, where his successes included winning the Embassy Premier Chase at Ascot with Ballinacurra Lad. While doing his schooling at Midleton’s Christian Brothers Jonathan was always busy around the horses on the family’s Windy Hill farm. Then with his background well established, he went to Coolmore’s national hunt stud, Grange Stud at Fermoy in County Cork, on finishing his schooling at Christian Brothers at 17. Among the horses standing at Grange during his time was the grand stayer Vinnie Roe. A winner of four Irish St Legers, Vinnie Roe became well known to Australians with his gallant performances under big weights in three editions of the Melbourne Cup. The first of these was his fourth behind another Irish stayer, Media Puzzle, in 2002 and this was followed by a second to Makybe Diva in 2004 and an eighth, again behind the legendary mare, the following year. Also on the roster was the Sadler’s Wells horse Oscar, whose efforts had featured a second to Peintre Celebre in the Prix du Jockey Club at Chantilly in 1997. After spending two years at the Grange Jonathan was asked whether he would like to spend the 2006 southern hemisphere breeding season at Coolmore’s property at Jerrys Plains in the Hunter Valley. “Naturally I agreed and I loved being in the Hunter and I stayed for the breeding season, doing mares and foals for a little bit and then I worked with the yearlings. 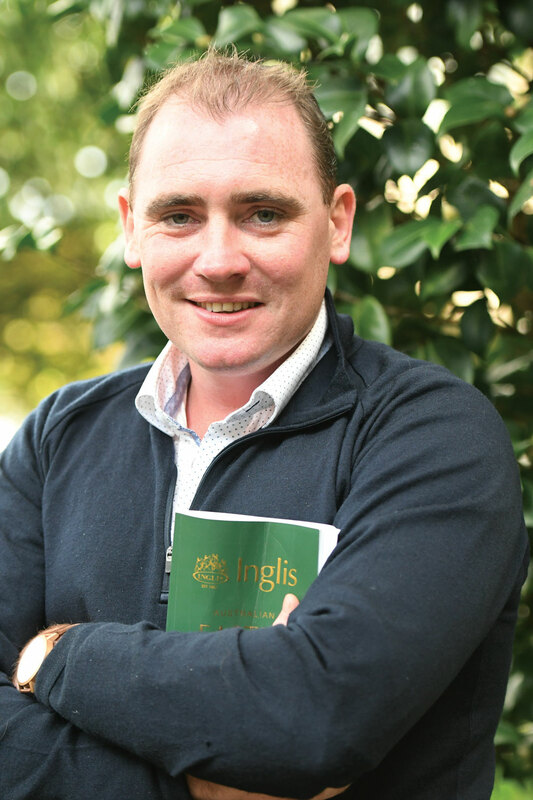 I went to my first Magic Millions yearling sale in January of 2007 before going home for six months after that.” Having acclimatized to the warmth and sunshine in Australia Jonathan found the cold, wet weather in Ireland difficult to cope with. “I missed Australia to bits and I was dying to return,” he said. The opportunity was presented when in the middle of 2007 he was given the chance to accompany 13 stallions being shuttled from Coolmore’s primary stud at Fethard in County Tipperary to Jerrys Plains. Among the high profile contingent were the likes of Encosta de Lago, Fastnet Rock, Fusaichi Pegasus (USA), Rock of Gibraltar (IRE) and Royal Academy (USA). In the meantime he had flown back to Ireland with the Fusaichi Pegasus entire Haradasun. Following his wins in the AJC Doncaster Handicap-Gr.1 and STC George Ryder Stakes-Gr.1, Coolmore purchased an interest in Haradasun. This led to the decision to send him to master trainer Aidan O’Brien at his Ballydoyle training grounds and he repaid the faith by capturing the Queen Anne Stakes-Gr.1 at Royal Ascot. On returning to the Hunter Jonathan took up his role selling nominations on his way to receiving a promotion to the additional position of assistant stallion manager. Jonathan was in his 10th year with Coolmore when he was transferred back to Ireland and into the registration office at Fethard, but he was dubious about the move. “It just didn’t suit me going back to Ireland, so I decided after around six months that I would like to return to Sydney,” he said. an opening came up with Julian Blaxland’s Blue Sky Bloodstock, which Jonathan accepted. In the care of Darren Weir Platelet, who is by Strategic from the Dracula mare Bloodline, proved a high-class mare by registering 10 wins, nine seconds and five thirds from her 32 racecourse appearances for earnings of nearly $1.4m. Her five black type wins were highlighted by victories over Angelic Light and Yosei in the SAJC Robert Sangster Stakes-Gr.1 and beating Conservatorium and Altar in the Goodwood Handicap-Gr.1 in 2013. Then, towards the end of last year, Jonathan was head hunted by Aquis Farm. While he does not have any hands on dealings with the stallions his relationship with Coolmore is proving an asset.